The nursery opens May 1st and is open Wednesday - Sunday through August 14th. We offer not only potted peonies which we are well known for but also, perennials, flowering trees, shrubs and evergreens. This year we have a wide selection of 30 different heirloom and disease resistant apple trees on dwarf and semi dwarf root stock. If you shop early we also have cherry, hardy pear and peach trees available in limited quantities. Many return customers look for our selection of Asiatic and Hybrid Lilies to add color to their gardens. All this and more is waiting for you at Hidden Springs Flower Farm. 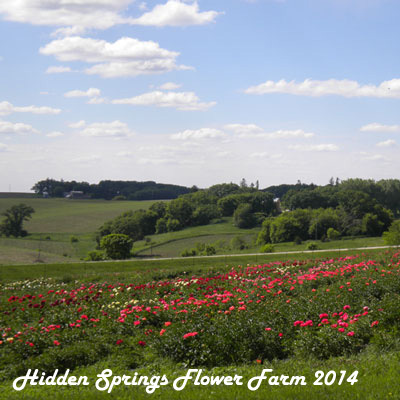 Hidden Springs Flower Farm is located 1.5 miles from the center of Spring Grove, MN. The street address is 18581 County Road 4. We suggest using Spring Grove in your GPS and then following the instructions below. Follow Highway 52 going south until the split at 44 and follow 44 straight ahead towards Mabel instead of going to Decorah. Follow Highway 44 going 7 miles past Mabel until just before you enter Spring Grove and turn left onto Houston County 4. Go down the steep hill around the bend and watch for the bright blue entrance gate, peony fields and nursery on the right. The greenhouse, tables filled with potted plants, trees and shrubs and the Garden Center are visible from the road. Come north on 52 or County 8 from Decorah and turn right onto 44 and follow the above directions. Cross the river at LaCrosse to LaCresent or coming from Onalaska come over the bridge and head south towards LaCresent. Follow 44 through Caledonia and 10 miles on toward Spring Grove. Go through town until you get to a slight rise in the road as you are exiting town and turn right by the cemetery onto County Road 4 down the hill 1.2 miles and we are on the right across the road from the neighbors big red barn. From Spring Valley take the scenic route and connect with Highway 52 at Preston or take interstate 90 and go east to the Highway 52 exit south of Rochester, go through Harmony veering left and follow 52 through Canton and instead of taking the turn off to Decorah go straight ahead on 44 through Mabel. Go 7 miles to just before you enter Spring Grove and turn left on County 4. Go down the hill about one mile and Hidden Springs Flower Farm is on the right.